GOM Video Converter is really a tool that can encode various video formats to AVI, MP4, WMV, FLV and OGM files. After a brief installation where you can activate the program to download some codecs, it is necessary to select a preset every time you start the application, such as Apple, Sony, Android, Blackberry or Microsoft . You only need to add one or more files, where the batch conversion supported, you also can set the output format and settings, set the output destination, and start the conversion. However, if you add an unsupported format to the list, GOM Video Converter program will crash. 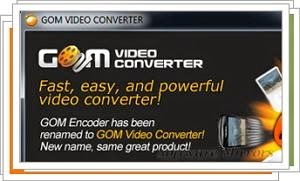 With GOM Video Converter, you can configure the settings for the output video codec, bit rate, keyframe interval, the video quality, scaling filter, an audio codec, video size, ratio, frame, color adjustment, video effects, the level of the audio sampling frequency, subtitle font, color and position. You can also attach a logo to your video and set the start and end, the level of transparency, position and size.